Before the accident flight, the commercial helicopter pilot, who was also a mechanic, had re-installed the main rotor blades, which had just been reworked, on the helicopter. The accident flight was a test flight to adjust the track and balance of the rotor blades. A mechanic, who spoke with the pilot a few weeks before the accident, stated that they had a discussion about an elongated pitch change link attachment hole on the accident helicopter and how to address it. On the night before the accident flight, they spoke again; the pilot was having trouble tracking the blades on the accident helicopter. The pilot stated that he could not get the blades to track any better, and that he was trying to change the track with the trim tabs. Witnesses in the area of the accident site heard "popping" or "banging" sounds, then saw the main rotor and empennage separate from the helicopter. Several of the witnesses then saw the helicopter tumble in flight and impact the roof of a building. The main rotor and empennage came to rest on the ground a few hundred feet from the building. Witness statements and wreckage documentation were consistent with a main rotor blade striking the tail and subsequently, a mast bump, which resulted in the helicopter descending uncontrollably. The damage observed on the components of the main rotor system was consistent with an in-flight separation of the pitch change link for the red blade, with separation occurring at the location where the pitch change link attached to the swashplate. The swashplate was free of contact marks corresponding to contact with the red pitch change link, which contrasted with the area around the blue blade pitch change link attachment, where multiple contact marks corresponding to contact with the blue pitch change link were observed. Also, the red pitch change link was intact and relatively straight, indicating that separation occurred under loads less than that required to buckle or fracture the pitch change link. The slight bending in the red pitch change links was likely secondary to the separation of the attachment at the lower end as evidenced by the location of the corresponding thread contact marks on the pitch horn. Finally, a series of impressions corresponding to contact with threads on the red blade pitch change link attachment bolt were observed on the attachment hole bore through the swashplate in an area that should have only contacted the grip portion of the bolt. Thus, it is likely that the intact bolt separated from the attachment due to loss of the lock nut and palnut. Torque measurements were obtained on the locknuts installed on the three recovered pitch change link attachment bolts. All measured torque values were lower than that specified in the helicopter's maintenance manual, indicating that the fasteners were improperly torqued before the accident. While torque for the missing attachment bolt could not be measured, the torque measured on the remaining pitch change link attachment bolts and witness marks on the attachment hole bore in the swashplate suggest that the bolt likely separated due to insufficient torque applied at the time of installation, which led to the loss of the locknut and palnut due to vibrational loads under normal operation. The pilot/mechanic's failure to properly secure the pitch link hardware of one main rotor blade to the rotating swash plate, which resulted in the pitch link separating in flight and a subsequent loss of control. 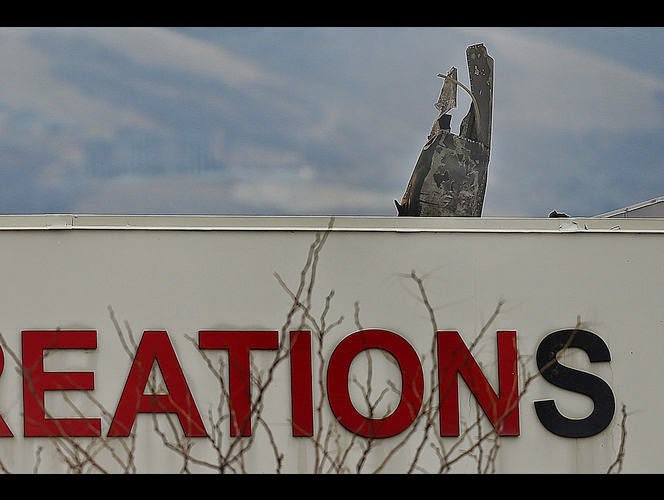 On December 2, 2014, about 1400 mountain standard time, a Robinson R44 II helicopter, N3234U, impacted a two-story building while maneuvering near Skypark Airport (BTF), Bountiful, Utah. The commercial pilot/mechanic and passenger were fatally injured, and the helicopter was substantially damaged. The helicopter was registered to Native Range Capture Services, Inc., Elko, Nevada, and operated by Native Range, Inc, Ventura, California. Visual meteorological conditions prevailed for the area, and no flight plan was filed for the local, post-maintenance test flight, which was conducted under the provisions of 14 Code of Federal Regulations Part 91. The flight departed from BTF shortly before the accident. According to the owner of the helicopter, the pilot/mechanic was performing maintenance on the main rotor assembly and the purpose of the post-maintenance flight was part of the procedure to "track and balance" the main rotor blades. This maintenance spanned over several days. Several witnesses in the area of the accident site heard "popping" or "banging" sounds then saw the main rotor and empennage separate from the helicopter. Some of the witnesses then saw the helicopter tumble in flight and impact the top of a building. The main rotor and empennage came to rest on the ground a few hundred feet from the impacted building. Security camera video footage from a nearby business captured the helicopter in the air shortly after the separation of the main rotor and empennage. The pilot, age 65, held a commercial pilot certificate with rotorcraft, airplane single-engine land, multi-engine land, and instrument ratings. The pilot held a Federal Aviation Administration (FAA) second-class medical certificate, which was issued on April 1, 2014, with no limitations. The pilot reported on his most recent medical certificate application that he had accumulated 5,500 total hours of flight experience. The pilot was issued a mechanic certificate on August 17, 2012, with ratings for airframe and powerplant. He attended the Robinson Helicopter Company's maintenance course in December 2008. 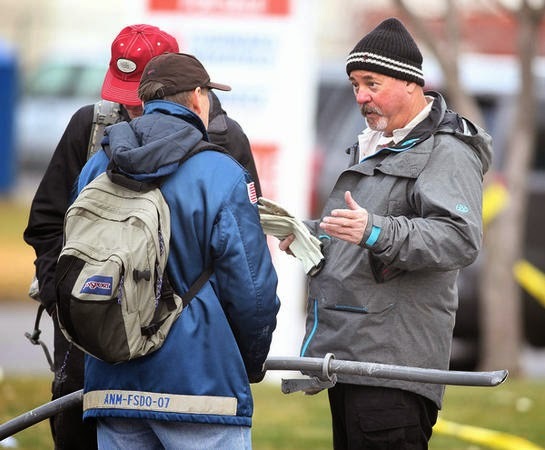 The passenger, age 63, held a private pilot certificate with a rating for airplane single-engine land. He held an FAA third-class medical certificate, issued on October 26, 2006, with the limitations that he must have available glasses for near vision, and not valid for any class after. The pilot reported on his most recent medical certificate application that he had accumulated 250 total hours of flight experience. He was issued a mechanic certificate on September 9, 2008, with ratings for airframe and powerplant. He had not attended the Robinson Helicopter Company's maintenance course. The four-seat helicopter was manufactured in February 2007. It was powered by a Lycoming IO-540-AE1A5 reciprocating engine rated at 205 horsepower. The helicopter's owner stated that, during a flight in the accident helicopter the month before the accident, the helicopter "had a bit of a vertical [vertical vibrations]". The blades also had noticeable slop and movement in the pitch change link bolt attachment to the swashplate. During a 100-hour inspection, on November 2, 2014, at 582 hours of helicopter total time, the owner and pilot/mechanic recommended sending the blades out for rework. According to airframe records, the [red] main rotor blade pitch horn was replaced, and the pilot-rated mechanic declined repainting of the blades. When the blades returned, the owner hired the pilot-rated mechanic to install the blades and track them in a heavier configuration. According to a mechanic who spoke with the pilot a few weeks before the accident, they discussed an elongated pitch change link attachment hole on the accident helicopter and how to address it. On the night before the accident flight, they spoke again, and the pilot said he was having trouble tracking the blades on the accident helicopter. He reported that the blades could not track any better than a 1/2-inch separation, and that he was using the trim tabs to change the track. The mechanic suggested that the pilot use the fine adjustments on the pitch change links, then fly through all flight regimes, and fine tune with the trim tabs. He recommended to the pilot to look at the entire rotor system and thought that something was amiss. Review of the helicopter's maintenance records showed that on September 12, 2007, at 87.3 hours total time, the hub and blades were rebuilt by Robinson Helicopter Company. The spindles, which include the pitch horns, were reused during the rebuild. The 1353 weather observation at Salt Lake City International Airport (SLC), Salt Lake City, Utah, located 5 miles south of the accident site, reported wind from 320 degrees at 3 knots, visibility 10 statute miles, scattered clouds at 15,000 feet above ground level, broken clouds at 19,000 above ground level, temperature 8 degrees C, dew point 2 degrees C, and an altimeter setting of 30.05 inches of mercury. Examination of the accident site by the National Transportation Safety Board (NTSB) investigator-in-charge (IIC) revealed a wreckage debris field about 880 ft in length, about 400 ft in width, and oriented on a 277° magnetic heading. The main rotor and empennage separated from the main wreckage before impact and were found within the wreckage debris field. The main rotor assembly was found near a parking lot about 188 ft from the main wreckage. The empennage separated from the main wreckage and was found near a parking lot about 430 ft from the main wreckage. Several sections of the tail rotor drive shaft were found throughout the debris field. A large section of the tail rotor drive shaft pierced the roof about 90 ft from where the fuselage entered the roof. Both pitch change links and transmission housing material were found throughout the debris field. Plexiglas sections were found throughout the debris field. 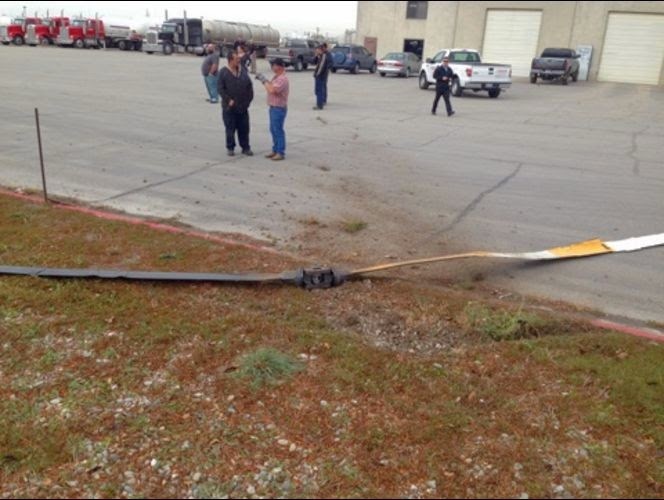 A 4-ft section of the main rotor blade tip was found in a retention pond and was furthest from the main wreckage. The main wreckage impacted and penetrated the roof of a two-story building about 2,000 ft southwest of the approach end of runway 34 at BTF. A postimpact fire occurred; however, the building's sprinkler system was activated, and an overhead sprinkler pressure line was separated near the main wreckage, releasing water and limiting the postimpact fire to the main wreckage. The main wreckage displayed impact damage and was partially damaged by the fire. The wreckage was recovered to a secure facility for further examination. The main wreckage, consisting of the cabin area and a 5-ft section of the tailboom, exhibited impact and thermal damage. The left side of the cabin was crushed inward towards the center, and the right side near the firewall was crushed inward. The rear seat area had minor thermal damage. The cabin area was crushed and distorted. Both forward seat structures were crushed inward and slightly forward. The front of the fuselage was crushed inward and the windshield was shattered. First responders cut the left forward seat belts. The right forward seat belts were unbuckled. The top side of the airframe had several disconnects and separations, and was bent to the right side. The tail cone separated aft of the number seven bay, and bay numbers 4, 5 and 6 separated into several sections, consistent with a main rotor strike. The left side of the number 1, 2 and 3 tail cone bays were flattened inward. The flight controls had several disconnects between the cyclic/collective and swashplate. All fractures exhibited signatures consistent with overload. The tail rotor flight controls had several disconnects from the pedals to the tail rotor, and all separations exhibited overload signatures. The fuel tanks remained attached to the airframe. The crossover hose fitting at the main tank was separated. The fuel vent hoses pulled apart from vent line fittings. The hoses and lines were clear of debris. Both fuel tank skins sustained impact damage, and the bladders remained intact. Both fuel caps remained secured to the filler neck. 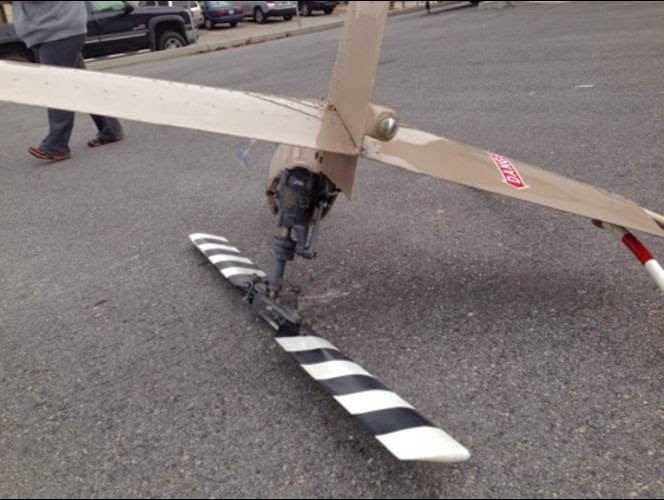 The empennage was fractured about 32 inches from the tail rotor gearbox mount. The tail rotor blades sustained minor impact damage. The tail rotor driveshaft exhibited an impact about 4 inches from the empennage separation. The curvature of the impact mark was consistent with the curvature of the main rotor blade leading edge. The tail rotor drive shaft separated in four places. The tail rotor blades exhibited signatures consistent with low rotor RPM at ground impact. The v-belts remained attached to the upper sheave and were split between the vees. The belts had thermal damage. The intermediate flex plate was distorted. The upper sheave forward and aft faces had rotational scoring around the entire circumference. The upper frame tubes adjacent to the forward face had scoring running in the direction of rotation of the upper sheave. The clutch centering strut had rotational scoring on its forward face adjacent to the aft face of the upper sheave running in the direction of rotation. The oil cooler had rotational scoring adjacent to the starter ring gear. The alternator cooling fan was distorted around its entire circumference. The main rotor gearbox (MRGB) separated at the gearbox housing. The MRGB mast tube fractured near its midsection. The MRGB drive shaft was bent below the swashplate and bent and separated at the teeter stop. The red blade remained attached to the main rotor hub. The separated sections of the outboard end were found in the debris field. The tip cap was broken, with the attachment bolts still integral to the main rotor blade. 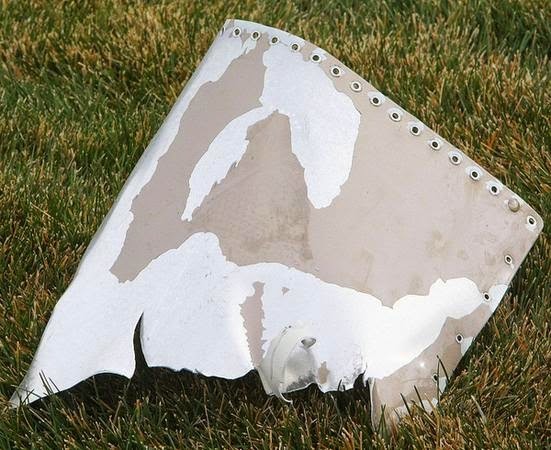 The blade tip and about 43 inches of the leading edge spar were found near the beginning of the debris field. Two afterbody sections measuring about 45 inches in length separated the tip. Gray paint transfer marks, about 2 inches wide and 4 inches long, were observed on the upper surface about 25 inches from the tip. The blade spar was bent forward about 15° beginning about 54 inches from the tip. The leading edge was damaged about 4 ft from the hub. Red transfer marks on the leading edge were found about 42 inches from the center of rotation of the blade. The pitch horn separated from the blade grip and the fractured surface was consistent with overload. Thread imprints were observed above the pitch change link upper rod end. The pitch change link remained attached to the pitch change horn and had multiple bends. The counterweights and hardware for the lower red blade pitch change link to swashplate attachment was not found. The blade droop stop was bent downward and remained attached to the grip. The blue blade remained attached to the main rotor hub. The tip cap separated from the blade and was found in the main wreckage. The blade spar was continuous from the inboard to the outboard end. The blade afterbody was fractured from the spar to the tip end to about 72 inches inboard. The spar was bent opposite the direction of rotation about 72 inches from the tip end, bent about 15° aft. The blade afterbody wrinkled aft of the spar attachment area from the tip end to 96 inches inboard of the tip end. The blue blade had impact marks on the leading edge, about 20 inches from the center of rotation. The curvature of the impact marks was consistent with the curvature of damage on the blue blade's pitch horn. The pitch horn was fractured at the blade grip, and the fracture surface was consistent with overload. Thread imprints were observed on the pitch horn above the pitch change link upper rod end. The droop stop was bent downward but remained integral to the grip. The pitch change horn was recovered in the debris field. The upper rod end remained attached to the pitch change horn but was fractured at the threads beneath the upper rod end bearing. The midsection of the pitch change link was recovered loose but was fractured at the pitch change link barrel. The lower section of the pitch change link remained attached to the swashplate. The threads adjacent to the lower rod end were bent. The main rotor hub hardware, including the bolts, shims, nuts, and safeties, remained intact. The hub exhibited impact marks of the blue blade grip contacting the hub, consistent with flapping exceedance. Similar impact marks of less severity were observed on the red blade grip side. A small upper section of the main rotor drive shaft remained attached to the hub via the teetering bolt. The small upper section separated a few inches below the hub, and was severely bent inward on the side of the red blade spindle. Coarse thread imprints were found on the lower edge of the hub immediately beneath the red blade coning bolt, consistent with a pitch change link. On the upper surface of the hub, adjacent to the teetering bolt on the red blade side, an impact mark was consistent with the impact from a pitch change rod link end bearing. The swashplate red blade pitch change link bolt hole exhibited dark surface markings on the outboard edge and about midway down the bore. Thread impact marks were found on the swashplate adjacent to the lower rod end bearing of the blue blade pitch change link attachment location. The landing skids were fractured in multiple locations. The aft crosstube separated from the main wreckage. The forward crosstube remained attached to the cabin. Both the forward left and aft left struts were bent aft. The engine remained attached to the fuselage. Thermal damage was noted to the wiring harness and ignition leads. The engine was covered in a sooty residue. The firewall and fuel pump housing exhibited impact damage. The magneto ignition leads exhibited impact damage near the distributer cap, and thermal damage near the cylinders. The lower sparkplugs were removed and revealed normal wear conditions with light gray deposits. Two of the spark plugs were saturated in oil. The crankshaft was rotated by hand, and cylinder compression was obtained. The ignition leads were cut near the thermal damage, and spark was obtained from all leads during crankshaft rotation. The magnetos were not removed during the examination. Rotational scoring was evident on the fan wheel assembly. The starter ring gear separated from the flywheel. The oil pickup screen was removed and was clear of debris. The exhaust assembly was crushed upwards. A detailed report of a follow-up examination is contained in the NTSB public docket. 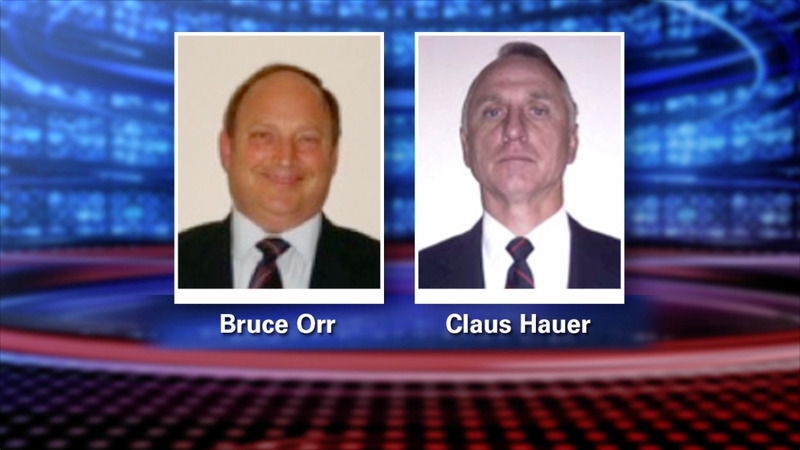 Postmortem examinations were performed on the pilot and passenger by the Utah Department of Health, Medical Examiner's office. The cause of death for each was reported as total body blunt force injuries. The FAA's Civil Aerospace Medical Institute performed forensic toxicology on specimens from the pilot. The tests were negative for carbon monoxide, cyanide, volatiles and tested-for drugs. The main rotor blades (both inboard sections), hub, upper mast section, upper drive shaft section, droop stops (2), yoke, pitch change links (2), main rotor blade pitch change horns (2), and swashplate were sent to the NTSB Materials Laboratory for further examination. The examination revealed that all fractures were consisted with overstress failure, and no preexisting cracking was noted. The examination also revealed that the pitch change link attachment hole for the red blade appeared intact and free of damage. The red blade pitch link was intact and relatively straight. The counterweights and the lower red blade pitch change link attachment hardware were missing. Torque measurements were taken on nuts installed on the three recovered pitch change link attachment bolts. The torque values for all three nuts were lower than that required by the manufacturer's maintenance manual. A detailed report of the examination is contained in the NTSB public docket. According to manufacturer's maintenance instructions, the attachment bolts used at the upper and lower ends of the pitch change links are NAS6605 series bolts. The locknuts for the NAS6605 series bolts should be fastened to a dry torque value of 240 lb-in ± 24 lb-in, and palnuts used on NAS6605 series bolts should be applied with a dry torque of 20 lb-in to 40 lb-in. During installation, the palnuts are installed over the top of the locking nut. 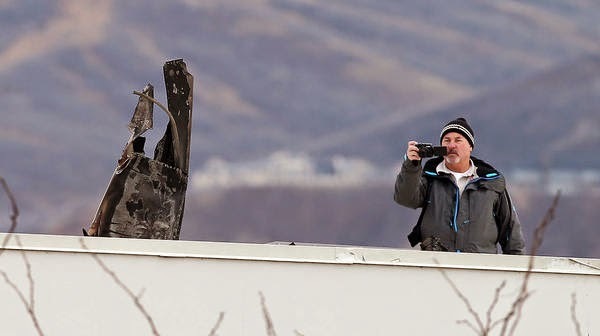 On December 2, 2014, about 1400 mountain standard time, a Robinson R44 II helicopter, N3234U, impacted a two-story building while maneuvering near Skypark Airport (BTF), Bountiful, Utah. The commercial pilot-rated mechanic and passenger were fatally injured. The helicopter was substantially damaged. The helicopter was registered to Native Range Capture Services, Inc., Elko, Nevada and operated by Native Range Inc, Ventura, California. The local flight was conducted under the provisions of 14 Code of Federal Regulations Part 91 as a post maintenance flight. Visual meteorological conditions prevailed for the flight, and no flight plan was filed. The flight departed from BTF shortly before the accident. Witnesses, who were in the area of the accident site, reportedly heard popping sounds then saw the main rotor and empennage separate from the helicopter as the helicopter flew overhead. Several of the witnesses then saw the helicopter tumble in flight and impact the top of a building. 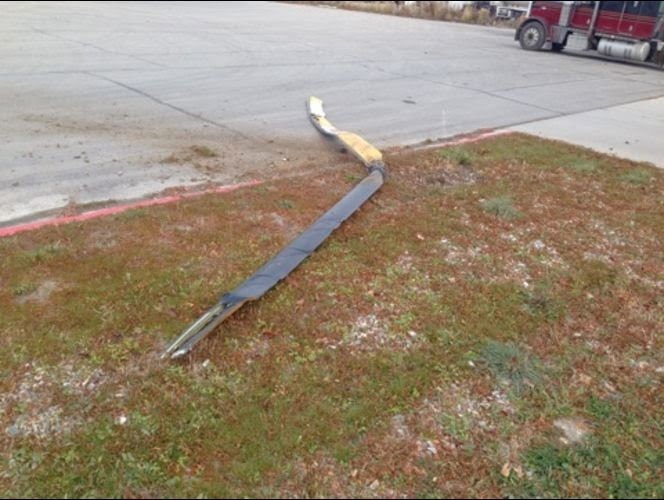 The main rotor blade and empennage impacted the ground a few hundred feet from the impacted building. The owner of the helicopter reported that mechanics performed maintenance to the main rotor assembly and the purpose of the post-maintenance flight was to check the "track and balance" of the main rotor blades. Examination of the accident site by the National Transportation Safety Board (NTSB) investigator-in-charge revealed that the helicopter impacted the top of a two-story building about 2,000 feet southwest of the approach end of runway 34 at BTF. A post-impact fire occurred that was concentrated at the main wreckage. The main wreckage had impact damage and was partially damaged by postimpact fire. The main rotor and empennage were found within the wreckage debris field. The wreckage debris field was about 880 feet in length and about 400 feet in width and on a 277 degree magnetic heading. The wreckage was recovered to a secure location for further examination. 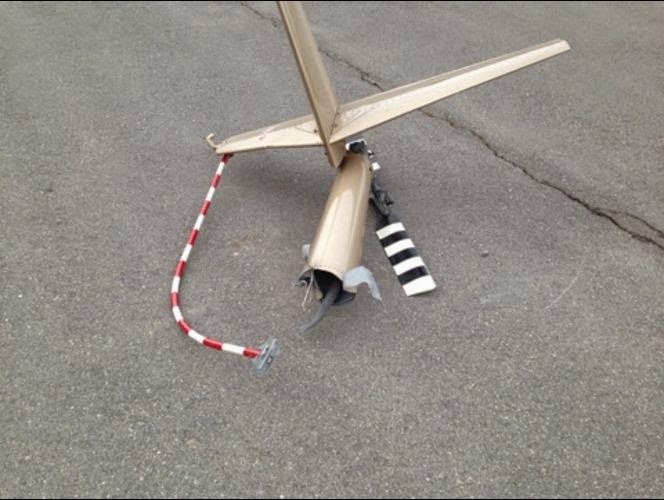 On April 23, 2017, at 1125 eastern daylight time, a Cessna 182G airplane, N2056R, experienced a loss of propeller blade pitch control during cruise flight. 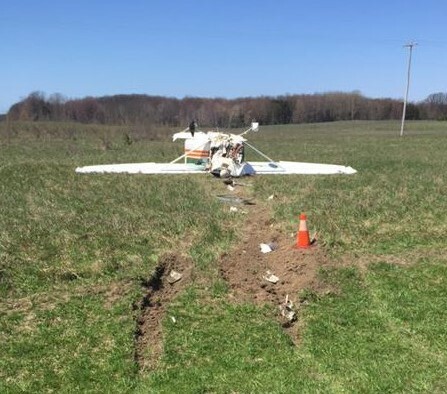 The pilot performed a forced landing to a field about 6 miles south-southwest of Manistee, Michigan, where the airplane nosed-over and impacted terrain. The airplane sustained substantial damage. The private pilot and three passengers received minor injuries. The airplane was registered to and operated by the pilot under 14 Code of Federal Regulations Part 91 as a personal flight that was not operating on a flight plan. Visual meteorological conditions prevailed at the time of the accident. The flight originated from Albert J Lindberg Airport (5Y1), Hessel, Michigan, at 1010 and was destined to Hastings Airport (9D9), Hastings, Michigan. The pilot stated that he arrived at 5Y1 about 0915 and performed a preflight of the airplane, which included inspecting the propeller. During the pre-takeoff airplane runup, he cycled the propeller three times, and the propeller functioned without anomaly. The departure weather for the flight from 5Y1 to 9D9 had an overcast layer of 3,000 ft mean sea level and a visibility greater than 10 miles. The overcast layer diminished to clear skies as the flight progressed southbound at 2,500 ft mean sea level along the Lake Michigan shoreline to the Cross Village, Michigan. After passing Manistee, Michigan, there was a "sudden" noise from the engine, an "instant" engine power loss, and a "heavy but steady vibration". The pilot stated the he did not have time to check the cockpit [configuration/selections] but did cycle the throttle, which resulted in no change in noise level or engine power. The pilot stated that he did not shut down the engine. He performed a forced landing to a field. During the right base leg to the field, the pilot saw powerlines and felt it unsafe to turn onto a final approach leg due to the airplane altitude, so he continued to land straight ahead. The airplane touched down with a "full" stall warning horn sounding and "immediately" nosed-over. A download of a J.P. Instruments engine data monitoring device showed that engine speed during approximately the last 1:50 minutes of the flight decreased to a range of 1,157 – 1,899 rpm. The airplane had installations of a Continental Motors O-470-R, serial number 130002-3-R-4, engine and a 1978 manufactured McCauley C66, model number D2A34C66-NP/E-S-90AT-8, serial number 787633, propeller that had a threaded blade retention. This C66 model was first certified in June of 1964. This type of propeller (and supporting spares) is obsolete and no longer produced by McCauley. Post-accident examination of the engine by the National Transportation Safety Board (NTSB) Investigator-In-Charge (IIC) and a Continental Motors representative revealed no mechanical anomalies that would have precluded normal operation. One of the two propeller blades was rotated about 90 degrees and was beyond its high pitch limits. Both propeller blades exhibited bending, twisting, paint scuffing, leading edge impacts, and overall propeller assembly damage is typical of that associated with low-level torsion at impact. The propeller was removed from the engine and sent to McCauley for disassembly and metallurgical examinations under the supervision of the NTSB IIC. Both propeller blades were manufactured before 1976 and had the following serial numbers: blade 1 - K96493YS, blade 2 - K96462YS. The last propeller overhaul occurred prior to installation on the airplane on June 7, 1993 (23 years and 10 months prior to the accident). The last propeller logbook entry was dated March 27, 2017 (approximately one month prior to the accident) and indicated a time since overhaul of 1,592.12 hours. The McCauley overhaul intervals of the C66 model propeller is cited in Service Bulletin SB137AF. The revision in effect at last recorded overhaul (SB137E) of the accident propeller and all subsequent revisions of SB137 have consistently recommended propeller overhaul at 1,500 hours or 60 calendar months, whichever occurs first. The propeller examination revealed that the propeller had indications of several post-delivery field service events including multiple ferrule drill holes, and red oil fill modification per McCauley Service Bulletin SB152A. The blade 1 actuating pin did not display damage or cracks. Blade 2 had a broken actuating pin (A-3149), which had indications that the pin failed in high cycle fatigue prior to impact. The pin material, hardness, and the combination cadmium and chrome plate finish was consistent with a pin manufactured sometime between start of production and May 1965. The pin material, and manufacturing methods were correct and compliant to the engineering requirements at time of production. On April 23, 2017, at 1125 eastern daylight time, a Cessna 182G, N2056R, experienced a partial loss of engine power during cruise flight. The pilot performed a forced landing to a field near Manistee, Michigan, where the airplane nosed-over and impacted terrain. The airplane sustained substantial damage. The private pilot and three passengers received minor injuries. The airplane was registered to and operated by the pilot under 14 Code of Federal Regulations Part 91 as a personal flight that was not operating on a flight plan. Visual meteorological conditions prevailed at the time of the accident. The flight originated from Albert J Lindberg Airport (5Y1), Hessel, Michigan, at 1010 and was destined to Hastings Airport (9D9), Hastings, Michigan. GRANT TOWNSHIP, MICH. - A small airplane traveling from the U.P. down to Hastings crashed in Mason County after experiencing engine trouble on Sunday morning, injuring four people, including two children. According to Mason County Sheriff Kim Cole, the Mason/Oceana County 911 Center received a call about an airplane crash around 11:30 a.m. on Sunday. The airplane was seen in the area of Sass and Morton roads in Grant Township. Mason County Sheriff's deputies and Michigan Department of Natural Resources law enforcement responded to the scene with Life EMS and Grant Township Fire & Rescue. The aircraft, a 1964 Cessna 182 Skylane, have four passengers onboard, including the pilot. It was traveling from Hessel, located in the Upper Peninsula, down to Hastings, which is near Grand Rapids. The pilot, a 39-year-old man from Caledonia, told deputies that the plane was experiencing engine trouble, so he attempted an emergency landing. The plane narrowly missed a tree line and skipped across Mason Road, struck a ditch and overturned. There were three other passengers on the plane, the pilot's 71-year-old father, 12-year-old son -- both from Caledonia -- and his 12-year-old nephew from Grandville. The pilot and his passengers were injured -- they were taken hospital, but are expected to be okay. Deputies say the National Transportation Safety Board has been notified and will be responding to the scene as well. The case will be turned over to NTSB for further investigation. 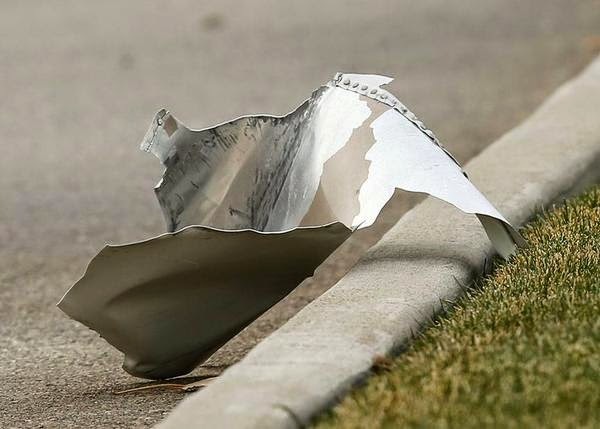 GRANT TOWNSHIP, Mich. (WOOD) — Mason County sheriff’s deputies say four people from West Michigan suffered minor injuries in a plane crash late Sunday morning. The crash happened at 11:25 a.m. in the area of Sass and Morton Roads in Grant Township. Grant Township is north of Ludington. Deputies say the plane, a 1964 Cessna 182G Skylane, was traveling from Hessel to Hastings when it began to have engine trouble. The pilot told deputies he tried to make an emergency landing by turning from a southerly direction to east, then west. The plane narrowly missed a line of trees, skipped across Morton Road, struck a ditch and flipped over. 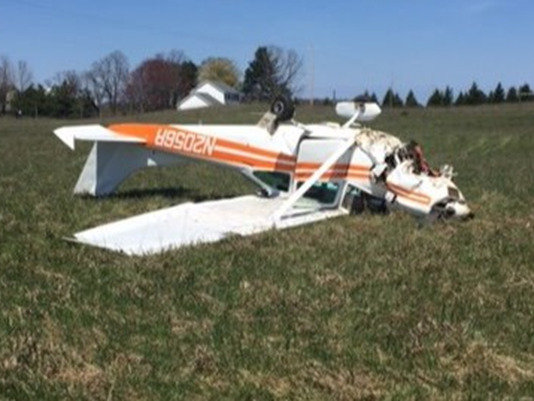 The pilot, a 39-year-old Caledonia man and his passengers, his 71-year-old father and 12-year-old son, both from the Caledonia area, and his 12-year-old nephew, who is from the Grandville area, were taken to an area hospital with minor injuries. Deputies say the investigation will be turned over to the National Transportation Safety Board. On August 17, 2015, about 0830 mountain standard time, a Quest Kodiak 100, N771RT, sustained minor damage when the pilot's seat slid aft and the airplane veered from the landing strip during the takeoff roll near Page, Arizona. The commercial pilot and five passengers were not injured. Redtail Partners, LLC owned the airplane and Arrow West Aviation (dba Redtail Aviation) was operating it under the provisions of Title 14 Code of Federal Regulations Part 135. Visual meteorological conditions prevailed and a company flight plan had been filed for the non-scheduled cross country flight. The flight was originating at the time of the accident with a planned destination of Canyonlands Field Airport, Moab, Utah. The pilot stated that the purpose of the flight was to transport the passengers back to Moab, which required him to depart from a remote paved road that was regularly used as a runway. The airplane began the takeoff roll, and after about 100 feet down the road, the pilot's seat slid back abruptly to the full aft position. Because his right hand was positioned on the power lever for takeoff, the pilot inadvertently retarded the lever to the idle position as the seat slid aft. The pilot released his grip on the control yoke in an effort to keep the nose down. His feet were unable to reach the rudder pedals and with the seatbelt in the locked position, he was not able to manipulate his body forward to regain control. The pilot further stated that the airplane began to veer to the left, continued off the pavement, and collided into a wire fence. After the airplane came to rest, the pilot was able to move the seat forward where he could reach the shoulder harness unlock-lever. The pilot and passengers egressed the airplane without incident. The Quest Kodiak 100 is a high-wing, unpressurized, single-engine turboprop-equipped fixed tricycle landing gear airplane manufactured by Quest Aircraft. The airplane was configured with 10-seats, two of which were adjustable seats in the pilot (left) and co-pilot (right) position. According to the records examined, the airplane, serial number 100-0059, was manufactured in November 2011, and was purchased by the operator in 2012. At the time of the accident, the airframe had accumulated a total time in service of 953.4 hours. The operator reported that the most recent annual inspection was completed on May 23, 2015, at which time it had accumulated 864 total hours in service. Standard seating for the airplane consists of six-way adjustable pilot and front passenger seat each equipped with a four-point passenger restraint system. They may be moved forward or aft, adjusted up or down and the seat back angle may be changed. The incident seat was part number 100-825-5010-01 and manufactured by Millennium Concepts, Inc. The seat was designed with two latches located on both the right and left side that are lifted to enable the seat to move along the track. The seat track consisted of two metal rails that were affixed to the floor along the longitudinal axis. The rails had two scalloped edges facing toward one another at one-inch spacing, creating numerous circular receptacles where the seat stop would engage when the seat was locked into position. The foot weldments would slide in the rails' channel under the scalloped upper layer. The latches were comprised of a plastic rocker-type handle that rotated about a plastic pin when raised upward. When lifted, two swages from the latch-end of the seat stop actuator cable would be pulled and in response the swaged end from the seat-track end would raise the seat stop (a pin-like metal cylinder that engages in the seat track receptacles). Each latch contained a swaged-end from both a left and a right side seat-stop actuator cable enabling both the left and the right seat stops to raise at the same time. The seat stop contains a groove where the actuator cable swages (one from the right and one from the left latch) are captured. The locking foot cap, a four pronged housing, encages the seat stop and the locking foot spring is located between it and the seat stop pin. With a latch raised, one of the swages captured in the seat stop pin (depending on if it was the right or left side latch) would override the force of the spring that normally holds the seat stop pin down against the lip of the foot weldment. This in turn would raise the seat stop pin leaving room between it and the bottom of the weldment lip (where the scalloped edges of the seat track rail can slide between). The latch gives no positive indication (feel) when effectively raised or lowered. The airplane's Pilot Operating Handbook contains a checklist in the "Before Takeoff" section that lists "seat locked and secure." The seat was removed and examined by investigators from the NTSB and Quest Aircraft. The complete examination notes with pictures are in the public docket for this accident. An external examination of the pilot's seat revealed that both the left and the right locking foot caps were damaged. Specifically, they were bent and the locking foot spring was displaced from the ridge it rests on. The forward tabs were bent forward resting outside of their respective foot weldments, the steel piece that slides on the bottom of the track that is positioned in between the stop halves. The aft tabs were bent forward and crushed about the aft foot weldment groove. Investigators removed the copilot seat and installed it on the pilot seat tracks. On the first attempts, the seat operation appeared normal and throughout the course of all the testing conducted, it was not possible for investigators to disengage the seat from the engaged position unless a latch was raised. Over numerous tests sliding the seat back on the rail with the locking pin initially disengaged, investigators were able to get the seat to move freely (not automatically lock the locking pin) only when applying an extreme side load or pulling one swage taught on the latch. Since the two feet are on independent systems, it was not understood how that could have occurred. The lack of positive response of the finger actuated latch made it difficult to verify if the seat was actually engaged. Investigators were able to replicate the position the seat would need to be manipulated to bend the locking foot cap. This could occur if the front legs weldments were out of the seat track and the seat was tilted backward. This likely would take place during maintenance and/or installation if the aft feet were not disengaged from the seat track and the technician wanted to push the seat all the way aft to the passengers' seats. The manufacturer provided detailed procedures illustrating the proper way to remove and install the crew seats. It is unknown if the damaged locking foot caps contributed to the incident. Following the examination, Quest queried their operators to see if any similar incidents had happened. A pilot reported that during takeoff, with the airplane configured in a steep nose-up attitude, his seat slid back and he asked the co-pilot to take the controls. The pilot stated he never adjusted the seat to see if the seat latch was engaged, rather entered into the cockpit and flew. 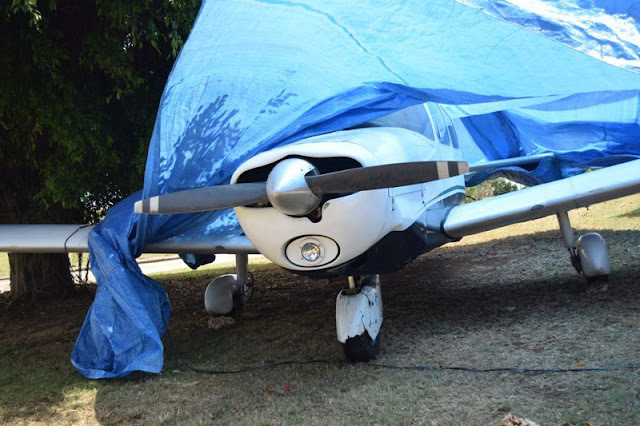 A Marianas Air Transfer Piper Cherokee made an emergency landing at Laolao Bay Golf & Resort in Kagman on Saturday just after 1 p.m. The pilot and two female Chinese tourists were unhurt. The incident occurred shortly after the conclusion of the Hyatt Regency Saipan 21st Annual Charity Golf Classic which was held at the golf resort. The four-passenger plane landed on the fairway leading to Hole No. 5 and stopped near the bushes next to the blue tee box, a spot for professional golfers. Dong Young “Edward” Lee, one of the tournament participants, said he had just finished his game when the incident happened. “That was my last hole,” he added. “I was eating [lunch] when I heard a plane had crashed there,” he said in an interview. The 25-year-old pilot, Josh Emmanuel Dominise, remained at the scene to talk to first responders while his two passengers were transported to the Commonwealth Health Center even though they were not injured, Variety learned. Dominise told the first responders that he took off from the Francisco C. Ada/Saipan International Airport at 1:06 p.m., but six minutes into the flight, he heard an explosion in the engine so he cut off the plane’s electricity and reported it to the control tower which advised him to return to the airport right away. He said he didn’t think he could make it to the airport and decided to land in Kagman, adding that he believed that the golf course was the safest spot for a landing. Variety was told that the flight was part of an “Island Discover Tour,” a 22-minute sight-seeing flight over Saipan. 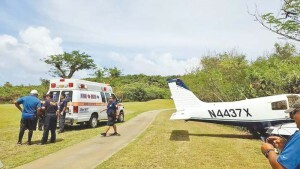 “At 1:11 p.m. on Saturday, April 22, a 4-seat Piper PA28-140 Cherokee Cruiser declared an emergency and landed at Laolao Bay Golf Course. The plane which is owned by Marianas Air Transfer Inc. was flying an island sight-seeing flight and was being piloted by Captain Josh Dominise who is employed by Star Marianas Air. 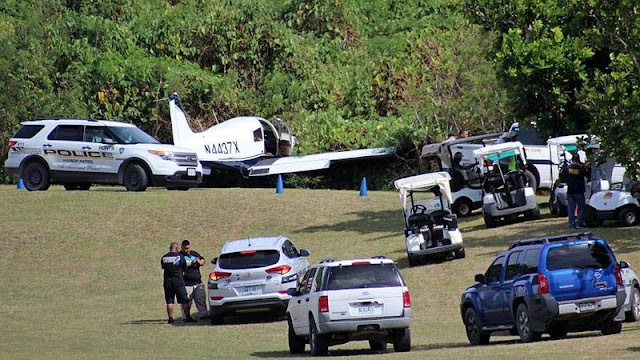 “The aircraft, which is not used by Star Marianas Air for airline operations, was north of the Laolao Golf Course with two passengers on board when the pilot heard the engine make a loud noise followed by a loss of power. Captain Dominise declared an emergency with the Saipan Air Traffic Control Tower and informed the controller that he would be making an emergency landing at the golf course. “There were no injuries as a result of the landing and an inspection conducted in coordination with the National Transportation Safety Board revealed no substantial damage to the aircraft’s structure. An initial inspection of the engine did reveal a significant crack on the engine’s block which is consistent with the pilot’s reported experience. Since the engine was purchased new from the manufacturer seven months ago, and had more than 70 percent of its useful life remaining, the NTSB has offered to assist in determining what may have caused what is preliminarily being considered a critical manufactures defect. “Late Saturday afternoon, the National Transportation Safety Board released the aircraft to Marianas Air Transfer, the aircraft’s owner. Star Marianas Air is assisting in getting the airplane transported to Tinian where its maintenance department will work with the Federal Aviation Administration, National Transportation Safety Board, and the engine manufacturer, to determine what needs to be done to ensure other engines of this type do not encounter a similar defect. The Department of Public Safety said that on Saturday, April 22, 2017, at 1:34 p.m., police and Department of Fire and Emergency Medical Services first responders were alerted to a possible plane crash at Laolao Bay Golf Course in Kagman. About six minutes into a sight-seeing tour of the island, a Piper PA28-140 Cherokee Cruiser plane of the Marianas Air Transfer Inc. experienced an engine problem, but its pilot successfully landed the aircraft on the fairway of the Laolao Bay Golf & Resort in Kagman last Saturday afternoon where a charity golf tournament was wrapping up. Fortunately, no one was injured. The Filipino pilot, Capt. Josh Dominise, and his two Chinese female passengers were not injured, witnesses and police said. The last group of golfers had just finished that particular hole so nobody was on that fairway, Saipan Tribune learned. Police and Commonwealth Ports Authority officers secured the site until National Transportation Board and Federal Aviation Administration investigators fly in, according to Department of Public Safety Commissioner Robert Guerrero on Saturday. DPS acting spokesman Sgt. Jason Tarkong said that on Saturday at 1:34pm, police and Department of Fire and Emergency Medical Services first responders proceeded to a reported plane incident at the golf course. Tarkong said upon arrival, police learned that the pilot and two passengers were safe. Tarkong said preliminary information showed that the pilot was required to execute an emergency landing on the golf course. He said FAA is handling the investigation. DFEMS spokesman Derek Gersonde said at 1:40pm their medics and rescue units from the Kagman and Susupe fire stations were dispatched to the crash site. Gersonde said upon arrival, medics came upon the four-seater “Cessna aircraft” with three individuals, including the pilot. The pilot refused to be treated by medics, while the 21-year-old passenger complained of head pain. The 20-year-old passenger complained of neck pain. Gersonde said the two passengers were transported to the Commonwealth Health Center emergency room. Gersonde said the plane took off from the Saipan commuter airport and was touring around Saipan when it performed an emergency landing. Star Marianas Air Inc. president Shaun R. Christian, in a press release, said pilot Dominise is employed by Star Marianas Air, but the aircraft is owned by Marianas Air Transfer. Christian said the plane was flying an island sight-seeing flight and the pilot declared an emergency at 1:11pm and landed at the golf course. Christian said the aircraft was north of the Laolao Bay Golf & Resort when the pilot heard the engine make a loud noise followed by a loss of power. Dominise declared an emergency with the Saipan Air Traffic Control Tower and informed the controller that he would be making an emergency landing at the golf course. Christian said there were no injuries as a result of the landing and an inspection conducted in coordination with the NTSB revealed no substantial damage to the plane’s structure. Christian said an initial inspection of the engine did reveal a significant crack on the aircraft’s engine block, which is consistent with the pilot’s reported experience. “Since the engine was purchased new from the manufacturer seven months ago, and had more than 70 percent of its useful life remaining, the NTSB has offered to assist in determining what may have caused what is preliminarily being considered a critical manufactures defect. Christian said late Saturday afternoon, NTSB released the aircraft to Marianas Air Transfer. Christian said Star Marianas Air is assisting in getting the plane transported to Tinian, where its maintenance department will work with FAA, NTSB, and the engine manufacturer, to determine what needs to be done to ensure other engines of this type do not encounter a similar defect. Christian said an NTSB incident response team representative commended Dominise for his quick decision making and his successfully executed emergency landing. Christian said although Star Marianas Air does participate in the operation of the flight seeing island tours by providing pilots and operational support, the aircraft involved is not owned by Star Marianas Air. He said the aircraft is also not used by the airline to conduct passenger carrying flights between the islands. A witness told Saipan Tribune that the plane landed on the fairway in hole No. 5 green west course, ran about 200 yards before it stopped just next to the bushes. The Hyatt Regency Saipan 21st Annual Charity Golf Classic was about to be finished when the incident happened. A tournament participant said he was about to eat lunch at the hotel’s restaurant when he heard some people talking that a plane had just crashed at the golf course. The golf player, who requested anonymity, said he proceeded to the direction of hole No. 5. “I was looking for a smoke. But there was none,” he said, adding that he then saw the pilot and the two passengers talking to some golf players. The emergency landing left marks on the fairway. A retired law enforcer, who happened to be at the golf course, said he was impressed with the smart decision and the skills of the 24-year-old pilot in making a successful crash land at the golf course. On Nov. 19, 2012, a passenger was killed and six others, including the pilot, were injured when a seven-passenger Piper PA-32 Cherokee Six operated by Star Marianas Air lost power while taking off Saipan airport on its way to Tinian and nosedived into the trees adjoining the north side of the runway where a fire then ensued. All six passengers were Chinese nationals. On Oct. 6, 2013, a Piper Aircraft of Star Marianas crashed three miles north of the Tinian International Airport, killing the pilot and two of the six passengers. The four other passengers were injured. The plane was completely destroyed. All passengers were Chinese nationals. On Aug. 1, 2006, the pilot and six passengers were injured when a Piper Cherokee of Taga Air Charter Services crashed on a farm in upper Dandan en route to Tinian. Except one who is an American, all passengers were Japanese nationals. SAIPAN – The National Transportation Safety Board on Saturday afternoon released the four-passenger Piper Cherokee aircraft that made an emergency landing on a fairway at LaoLao Bay Golf and Resort in Saipan. The plane was released after no substantial damage was found. The aircraft was moved from its landing site to the resort's maintenance area for safe-keeping. After the initial investigation by Department of Public Safety and NTSB, the aircraft was released at 4:58 p.m. to its owner, Marianas Air Transfer Inc.
DPS Public Information Officer Jason Tarkong in a statement said the Federal Aviation Administration is now handling the investigation. In a statement Sunday, Star Marianas Air Inc. said the plane is owned by Marianas Air Transfer Inc. It was flying an island sight-seeing flight piloted by Capt. Josh Emmanuel Dominise, who is employed by Star Marianas Air. Star Marianas Air said it does not use the plane for airline operations. The 25-year-old pilot and two female Chinese tourists, identified as Wen Xuan Ding and Tong Tong Dai, survived unhurt when the aircraft made an emergency landing at the fairway of Hole No. 5 on Saturday around 1 p.m. The incident occurred just after the conclusion of the Hyatt Regency Saipan's 21st annual Charity Golf Classic, which was held at the golf resort. Dong Young "Edward" Lee, one of the tournament participants, said he had just finished his game when the incident happened. "That was my last hole," he added. "I was eating [lunch] already when I heard there was a plane that crashed there." Dominise remained at the scene to talk to first responders, while his two passengers were transported to the Commonwealth Health Center. Dominise said he took off from the Francisco C. Ada/Saipan International Airport at 1:06 p.m., but six minutes into the flight, he heard an explosion in the engine, so he cut off the plane's electricity and reported it to the control tower, which advised him to return to the airport immediately. He said he didn't think he could make it to the airport so he decided to land on the golf course, which he believed was safe for a landing. The flight was part of an "Island Discovery Tour," a 22-minute sightseeing flight in Saipan.